Lisa and I met twenty-some years ago when both of us were teaching English as a Foreign Language in Seoul. While I stayed at my university, she moved on to teach in several different countries, earn a doctorate in Australia and do research in educational issues. She is now the director of the English Language Institute in Jackson College in Jackson, Michigan. We spoke via Skype. During the interview she frequently chuckled at memories of past difficulties. Probably my most relevant and significant experience teaching abroad was in Afghanistan and Iraq, two post-conflict countries. I was fairly lucky in not having a lot of traumatic experiences—[laugh] no, I’ll take that back. 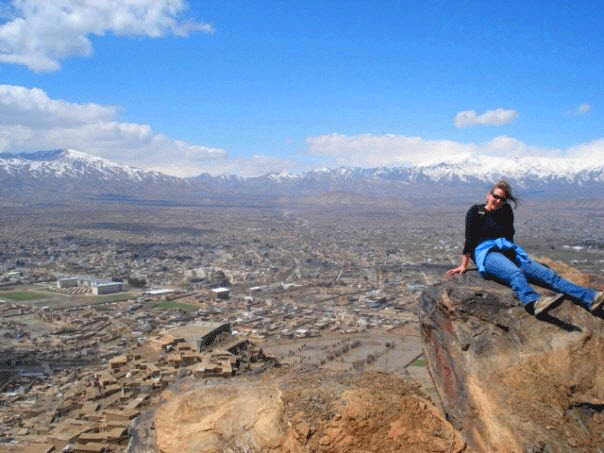 I went to Afghanistan in 2006 to teach at the American University of Afghanistan, AUAF, a private school. I arrived before the school opened. The US had entered the country five years before, and it was reasonably “safe,” that is, with fewer suicide attacks than in recent years. The AUAF was on the old campus of Kabul International School, which was closed when the Soviets invaded in 1979. One building had been completed on one building and was in progress on another. All the others were still in ruins from the civil war, the fighting between warlords that occurred after the Soviets left. In that environment you had to be flexible and resourceful because it was difficult to get things shipped into Afghanistan cheaply. For example, we got two shipping containers of books from a library overseas. We thought, “Oh, that’s great.” But we didn’t have a librarian then, and it took a long time for the teachers to go through the books. We had only one projector for PowerPoint. We bought white boards, but they weren’t the best quality, so they kept falling off the classroom walls. You just never knew what was going to happen. For instance, we had a main generator and a backup. Once the guards turned them both on at the same time, and the power surge blew out a lot of lights. I was printing off lessons for my class, and my printer caught on fire. I had to go to the other building, which was connected to another generator, to get my handouts done. So, stuff like that. At first we had fifty Afghan students between the ages of 18 and 25. We tried to get documentation about their high school diplomas and what-not, but in places like Afghanistan and even Iraq a lot of them had been destroyed. Records are not top priority during conflict. So we had difficulty finding out how much education the students had. We did some needs testing, then designed and put the students through a six-month program in English for Academic Purposes and math. The undergraduate program started afterwards. I have to say we chose well because those fifty students went on, the majority of them got bachelor’s degrees and a majority of the graduates got Fulbright scholarships. So that’s something to be happy about. The teachers all lived in the guesthouse. We didn’t know when we’d have power. We didn’t always have water. For a couple of months we didn’t have a washing machine, so I washed my clothes by hand and hung them outside to dry. In winter they mostly froze. When there was a suicide attack in the area, we congregated in a place in the guesthouse with no windows. We really bonded because we had to depend on each other and we tried to find the humor in the situation. One of the teachers had a master’s in storytelling in addition to his master’s in ESL. He would always tell stories. We’d hear explosions and automatic weapons fired all around us, and we wouldn’t know whether they’d hit our building, but he’d laugh and joke and make us all a little less scared. Those are really good memories. How often did these attacks happen? In those days, winter was kind of a quiet time, with the Taliban stuck in the snow up in the mountains. The spring offensive would start around April. Attacks could vary. Three years ago I was back in Kabul, and in about two or three weeks we had four attacks in various parts of the city. You just didn’t know when and where it was going to happen. Kabul itself tends to attract more violence because the government’s there, the embassies are there–both agencies the Taliban likes to target–while in other parts of the country it’s not that bad. In the two years of 2011-2013 when I was working in Herat, in western Afghanistan, there were no attacks. I would imagine dealing with some difficult cultural things in your daily life. I had more freedom in Afghanistan than I did in Iraq. In Iraq I was pretty much behind walls most of the time, as stated in my contract. In Afghanistan—in both Kabul and Heart—we were sometimes in lock-down. If it lasted three or four days you got kind of crazy. But Afghanistan is a beautiful country, very mountainous. Kabul is surrounded by the Hindu Kush When we could leave the guesthouses and the university allowed us, I’d go up on the hillside with Elizabeth, my friend and colleague. There were mud-brick homes without power or running water. One of my students said they used car batteries to power light bulbs or whatnot. Once we got a bag of balloons, blew them up and let them fly into the sky. All these kids ran after them and caught them. They were laughing, and we were laughing. It was so much fun. At the women’s park in Kabul we’d go to join the girls playing soccer. The women would be sitting around talking and then just start singing. It’s quite beautiful at the lake about thirty minutes outside Kabul. There’s a restaurant beside the lake where you could sit. People were so relaxed, and some would go swimming. Unfortunately, few people go there now because of attacks. This recent attack in Kabul was quite disturbing. Eighty people were killed. The majority of Afghans are very friendly and hospitable. The family of one of my students was always inviting me over, taking me in like a host family. Like other Afghans, they had been through so much, but they just found a way to live their lives despite decades of conflict. Their resilience was amazing to me. I found that with the Iraqis as well. It fascinates me that people can live with so much trauma—which is not to say that people didn’t have problems or weren’t affected by these events but that they seemed to overcome and find a way to be happy. I didn’t ask, but I’d pay attention if students wanted to tell me stories, particularly in their essays for writing class. I had a student I hadn’t formed an opinion about because he was so shy and quiet. He was about nineteen when he started with the first group attending the university. In one of his essays he wrote about going to school when he was young and getting too close to a suicide attack. He wasn’t hurt, hit but he was covered with the blood of the people around him. Reading that gave me a different perspective on him, I thought, “Oh, my God!” Similar stories often came from students who were very quiet—horrible things. .
One young woman wrote that her mother had been a university teacher, but she was killed in her classroom by a bomb meant for the dean. Seriously, I could tell you stories upon stories. The young people in my classes just were trying to get an education and have a chance at life. It was amazing what some of them had gone through. I really admired them. So that was part of the reason why you were there, your respect and affection for your students? Yeah, me too. Where were you then? Portland Oregon the first time and continued protests to withdraw troops later were in Australia. I went to a large demonstration in Seoul. I thought it was okay since I was protesting against my own government and not against Korea. To me, invading Iraq was just stupid. Afghanistan was slightly different, although Osama Bin Laden wasn’t even in Afghanistan. He was in Pakistan. But I felt that, as much as I disagreed with the invasion, I wanted to be part of the education process. I wanted to help give people a choice of leaving the country or changing it. That was probably my primary reason for going back several times. After my first two and a half years I returned to Australia to work on my doctoral degree, but then I went back. So what were things like in the classroom? Well, even in the public universities the typical classroom was coed, but the students tended to sit with girls on one side, boys on the other. Teaching at AUAF was nowhere near as challenging as teaching at a public university in the provinces. The main difference was class size. While AUAF limited its classes to about 25 students, my undergraduate classes at Herat had 50-75. There weren’t always enough desks, and the classrooms were much smaller. Then there was the shoddy supply of electricity even in Kabul. American University had generators because we were a private school, but public universities struggled more. I taught in a classroom where the window panes were broken, letting the wind in, and it got really cold in the winter. I tried to cover the holes, but it didn’t work. So I bought glass panes and some light bulbs. There was no money for things like that in the department budget. If a classroom light bulb went out, the students would pool their money for a new one, or maybe the teacher would buy one. The Iranian-made ones were better quality than the Chinese-made ones. I bought some $10 light bulbs, and then somebody stole them. How did you manage with 75 kids in a class? What did this division between boys and girls look like in your classroom? Well, I mentioned that boys sat on one side and girls on the other. The invisible line was always there. There were times when I could mix them up—with group work or whatnot. Some of them were okay with that. Except during the Taliban period, there was a tradition of coed higher education. It’s not like the Arab countries where it’s been traditionally separate, with males and females in different parts of the university. It’s just that conservative wave came in, very similar to what happened in Iran as well, going from progressive to conservative. In photos from the 60s and 70s, women in Afghanistan and Iran dressed very much like Western women. They wore short skirts. They didn’t cover their heads. They were very open. When I was teaching at the University of Pittsburgh in the English Language Institute, the Saudi students would group themselves in the same way, men on one side and women on the other. If a woman was wearing a skirt that hiked up over her knees when she sat down, she’d pull out a handkerchief and put it over her knees, so as far as the men could see she was covered from below the knees up. And the women would be giggling and speaking among themselves so that it was difficult sometimes to get them to stop. Did you find similar behavior or behavior that was a little strange? In high school the students were separated by gender. University was the first time they were actually in the same classroom together. There was an interesting dynamic among the freshmen. I The boys didn’t know how to talk to the girls. There was just a lot of posturing and showing off, They were what—18? Sometimes 20. Unfortunately, girls did get harassed, say if a boy liked a girl and she wasn’t interested. I preferred the seniors. They were all so used to each other that being in the same class was no big deal. A reader who once taught in Afghanistan writes: I really enjoyed Lisa’s story. Looking forward to part II!! !